Shampoo panted as she rushed along the burning sand of the beach, the heat searing her feet all but forgotten as she sprinted towards the ocean. Her search had gone on for two hours, but any thoughts of tiredness were banished from her mind. In the distance, a small, burned body lay face-down in the sand. Waves lapped rhythmically over it, gently rocking the lifeless body back and forth. Shampoo was abruptly brought to a halt by the sickening stench of scorched flesh that assaulted her nostrils. Skidding to a stop, she had to fight the retching that suddenly gripped her stomach. "Horrible," she moaned. Holding her stomach firmly, she took a shaky step forward. Steam rose lazily from the body which lay naked, its clothes long since burned off. A faint hissing sound filled the air with every fresh wave of water that splashed across the body. Blackened flesh and singed hair greeted Shampoo's eyes as she peered more closely, holding her nose closed between thumb and forefinger. A large gash ran across the body's back, the wound cauterised by the immense heat. Deep black scorch marks obscured most of the features of the corpse, but as Shampoo circled around to its other side, she caught sight of a sliver of pure white. "The sword," she gasped. She had assumed it would have been swept away by the ocean. Ranma's blackened hand was closed tightly around the sword's handle in a solid grip. Shampoo looked back at the sizable wound on Ranma's back and wondered how the girl had managed to grip the sword that skewered her after the fall. She reached down and took ahold of the sword's handle, and tugged it gently. Ranma's grip was strong; all Shampoo managed to do was tug the girl's body slightly along the sand. Frowning, Shampoo tugged harder, but still found she could not free the sword from the corpse's grip. "I'm sorry," Shampoo whispered quietly as she reached for her sword. It did not feel good to desecrate the dead, but she had no choice. Bringing her sword to Ranma's arm, she pressed the edge against the girl's wrist, then slowly raised the blade, ready to slice. "Nnng ...." Ranma moaned into the sand, her hand loosing the sword for a moment then gripping it more tightly than before. "What the hell?" Shampoo exclaimed, jumping back in utter shock. She landed on her backside a short distance away and stared at Ranma. "She's ... alive?" Ranma moaned again, a pained, pitiful sound; barely audible through the soaked sand. Her body shifted slightly, and she choked, trying to breathe. Sheathing her sword, Shampoo leaned forward and gingerly placed a hand on Ranma's shoulder, using it to turn the burned girl over onto her back. Ranma's chest rose and fell shakily with laboured breath. Her frail body shivered in the sea breeze, her teeth chattering loudly. "This can't be," Shampoo murmured, eyes wide in fright. "It's impossible." The impossible proof, however, lay before her; with every twitch of her body, Ranma terrified Shampoo further. Shampoo's mind boggled as she tried to decide what course of action to take. Her train of thought was interrupted, however, as she noticed a small red symbol on Ranma's stomach, just above the sword wound. She did not recognise it; she did not need to recognise it to feel unsettled by it. Wisps of steam rose slowly from it and as Shampoo lowered her hand toward it she could feel an intense heat that threatened to burn her. She swallowed nervously and decided to take the girl to one who would know what had happened. Slipping one arm under Ranma's neck, the other under her knees, Shampoo lifted the limp body off the ground and started back toward her village, Ranma's sword dragging along in the sand behind her with every hurried step. "This can't be good ...." Shampoo uttered, looking down at the smouldering body in her arms. "After I fell, the first thing I remember is waking up in the Amazon village again." "Let me get this straight. You were shot with an arrow, fell off a cliff, and survived," Akane said, flatly. "That's the craziest story I've ever heard." Ranma smiled at her companion. "Well, you're still young yet. You'll hear stranger ones, I'm sure." "You're serious, aren't you?" Akane asked, shaking her head in disbelief. "You honestly expect me to believe that?" A light rustling sound came from the bushes behind Akane; before the Tendo girl could even blink, Ranma was standing, sword drawn, peering intently at the bushes. "Get down," she said, stepping past Akane. "Stay behind me." Akane nodded dumbly, lowering herself closer to the ground as she turned to watch Ranma. Her mind was far too busy wondering how Ranma had moved so quickly to spend time debating whether or not to follow Ranma's order. Ranma crouched slightly, staring deeply into the bushes, eyes scanning back and forth amongst the foliage. As she caught sight of something moving, she slowly and silently slid her sword back into place beneath her cloak. Her hand moved slightly toward the bush and then - suddenly, in a flurry of red hair and black fabric - darted into and out of the bushes. Akane jumped slightly at the sudden movement, and stared at Ranma as the redheaded girl turned to face her -- holding up a small, furry object. The object wriggled violently in Ranma's hand, trying desperately to break free. Akane peered at the furry ball, recognising it as a tanuki. The small raccoon dog shivered uncontrollably in Ranma's icy grip as the chill air around her leeched away its body warmth. "Oh! How cute!" Akane exclaimed. Jumping to her feet, she stepped over to pet the animal. The tanuki wriggled against Ranma's hand, trying to escape her chill touch. It rubbed itself up against Akane's far warmer hand as she touched it, much to Akane's delight. Akane petted the creature happily, cooing gently to it as it pressed its head up against her fingers. Ranma sighed, exasperated, as Akane fawned over the animal. "We must leave," she said firmly. "Now." "Why?" Akane asked, looking up from the animal for a moment before returning her attention to it. She ruffled the thick, black fur atop its head, a little too enthusiastically for the creature's liking. "What an adorable little thing you are!" "Because," Ranma said, pulling the tanuki away from Akane's affectionate hands and lowering it to the ground, "there are more dangerous things in this forest than tanuki." The tanuki realised this as well, darting into the bushes and scampering away from the humans as fast as it could. Akane watched the bushes sadly as the sound of the tanuki's retreat faded into silence. Sighing, she looked over at Ranma, who was peering up between the branches and leaves overhead, at the grey sky above. "We've spent too long here as it is," Ranma said. "The sun will be coming up soon. We should press on. If we leave now, we'll be there by tonight." "Tonight?" Akane asked, her mood suddenly improving. "Then you can start teaching me about these hunters?" "There are a few other things to be done first," Ranma replied, looking over her shoulder at Akane as she stepped toward the edge of the clearing. "Like what?" Akane asked, stepping after Ranma. "You said you'd teach me!" "Perhaps we'll start the lessons now," Ranma replied, arching an eyebrow. "Patience is the first thing you should learn." "The details will come in time. Don't worry - you won't be bored in the meantime." "What do you mean?" Akane asked, pushing aside a branch as she stepped into the forest behind Ranma. "You'll see," Ranma replied as she stepped around a tree. "Be patient, Akane. You'll have your chance to avenge your mother." "That's all I want," Akane replied, a determined edge to her voice. The rumble that her stomach emitted was no less determined. "Although some food would be nice." "I could catch another tanuki, if you're hungry," Ranma offered. "That's not funny," Akane replied, paling slightly. Ranma smiled over her shoulder at Akane as she led her young charge into the depths of the forest. Neither noticed the pair of eyes watching them intently from the treetops. They're waiting for you. It's time to wake up. Ranma groaned hoarsely, her throat too dry to form words. Slowly, straining as if she were lifting mountains, she managed to force her eyelids open. A hazy brown light filled her eyes, stinging them; she quickly closed them again and waited a moment before daring to try again. As she blinked, the haze seemed to coalesce into more solid lines and shapes. A searing pain scratched across her face, behind her eyes, and she instinctively tried to raise her hand toward the pain. However, all she could manage was to raise it slightly before it started to shake uncontrollably. Groaning again, she lowered it once more. A fuzzy shape slid into her view, obscuring the light. A distant voice echoed into Ranma's ears from the shadows above. Grunting in concentration, trying to block out the loud ringing in her ears, she willed her eyes to move. Squinting, Ranma watched as the fuzziness slowly resolved into a face -- the face of an old woman. "You," she managed to squeak through her damaged throat, panic seizing her heart. "Stop fidgeting!" Cologne instructed, glaring down at the redheaded girl. "It will be a while before you can even move, so you might as well rest for now." Ranma tried to turn her head as Cologne stepped away from the bed and disappeared from sight, but found the old woman was right; she could not muster the strength. Her immediate panic faded somewhat as she realised Cologne did not intend to kill her; instead her mind began asking just why that was so. "How curious," came Cologne's voice. "You should be dead." The shuffling of feet filled Ranma's ears, and Cologne's face moved into view once again. The old woman bore a weary expression, dim eyes watching Ranma from within sunken eye sockets. She let out a long sigh, and shook her head. Ranma tried to follow Cologne with her eyes as the old woman turned and walked away from the bed. Sunlight flooded into the hut as Cologne pulled aside the cloth covering that hung across the doorway; Ranma squinted as the bright light burned into them, leaving Cologne as a vague silhouette against the doorway. "I know what you're thinking," Cologne added. "We're not going to kill you. You might as well just relax and try to get some sleep. I'll be back for you later." A songbird fluttered effortlessly across the treetops, choosing a sturdy branch upon which to land. Letting out a tuneful call, it looked back and forth through the forest, anxiously checking for any females who might have heard its song. Two females did indeed hear its call; but as they were of entirely the wrong species, the bird merely fluttered its wings in mild irritation and swept itself off the branch, soaring once more above the tree line. Akane heartily munched on one of the many apples she carried as she watched the small bird flutter off into the distance. Ranma kept pace alongside her, silently mulling over old memories that had lost no clarity or intensity through the years. Finishing one apple, Akane tossed aside the core and ravenously attacked a second, biting into the skin with gusto. The loud sounds of apples being demolished eventually grew to be too much for Ranma. "Sorry," Akane said sheepishly, pausing as Ranma peered at her. "I'm just so hungry." "It's all right," Ranma replied, something of a smile coming to her face, almost as an afterthought. "I don't mind. I'm glad you like the apples." "They're delicious!" Akane enthused. "Are you sure you don't want one?" "No," Ranma replied, shaking her head. "I'm not hungry." "No sleep, no food," Akane observed. "Aren't you tired?" "Not really," Ranma replied with a barely noticeable shrug. "Travelling around a lot must make you pretty tough," Akane commented. "And you've been travelling around for ... what?" Akane looked over at her travelling companion, who seemed to have sunk back into herself, eyes staring blankly off into the far distance. Akane watched Ranma for a moment, wondering how the girl held herself so still; somehow Ranma seemed to glide across the ground without moving her feet, her cloak making no sound as it was drawn across the grass. If it weren't for the occasional puff of misty breath that rose from Ranma's mouth, Akane decided the cloaked girl could very well be mistaken for a statue. Sighing, Akane abandoned hope of getting an answer, and returned her attention to her apple. The pair cleared a small, grassy rise, and as Akane peered beyond the slight elevation, she was stunned by the lush green valley that extended off into the distance, between two imposing mountains. "Oh, it's amazing," she breathed, taking in the sight of the deep, moist forest that blanketed the valley floor, the lush green vegetation a sharp contrast to the jagged mountains that framed it. Coming to a stop near a tree trunk, Akane leaned up against it and took a moment to appreciate the majestic beauty of the landscape before her, her eyes lost amongst the wonder of it all. Ranma stopped a few paces down the hill toward the valley, and turned to look back at the Tendo girl. "Are you tired?" she asked, looking around for a place to rest. "No, I just..." Akane began, looking down at Ranma for a moment, "I just haven't seen anything like this before. I mean, I've seen photos, but never...."
"It is a beautiful place," Ranma agreed at length, looking back to the valley herself. Akane nodded silently, watching a small flock of birds gracefully drifting across the valley below. "Come," Ranma said, gesturing toward the valley. "We should go. The forest may be beautiful, but that makes it no less dangerous to be wandering through at night." With another nod, Akane stepped away from the tree and started down the hill, a little behind Ranma. Something in Ranma's tone told her to believe that warning. "He's stronger than I thought." "Barely - he should be dead. He must have a strong will to have survived that fall." "Never mind that, child. If he is strong, he'll adapt." "This is all my fault. I'm sorry, Great-Grandmother." "You did what you had to. You will be punished for your failure, and through it you will become a stronger warrior." "I ... understand. How will I be punished?" "You will take care of him. You'll be his guide, and show him the Amazons mean him no harm." "Shampoo, you must understand. We must show him we mean him no harm. We must ally ourselves with him. You must show him, Shampoo, that we are not his enemies." "How can I show him that? I'm the one who caused all of this ...."
"Consider that your punishment. You dishonoured yourself in battle; prove your honour to that boy and you will redeem yourself." Ranma groaned, sweat rolling from her forehead as the echoed voices of her captors washed up on the shore of her consciousness, only to be swept away again moments later by a wave of dizziness. Feeling her grip upon reality wavering, Ranma was unable to stop herself from tumbling back down into the thick blackness below her, the echoing voices chasing her back into the dark, empty ocean. Akane yawned, stretching her arms above her head as the daylight slowly drained from the valley. The chirping of insects became louder with every passing moment; she found herself swatting the small bugs away with irritating frequency. The fact that Ranma remained completely unmolested by the insect life did not improve her mood. "Why don't these stupid bugs bother you?" she complained. "They stay away from me," Ranma answered, without looking back. "They don't like the cold." "Neither do I," Akane replied, folding her arms in front of herself and rubbing her upper arms for warmth. The humid forest air formed a thin, chilled mist around Ranma, the wispy fog circling endlessly around her. "Why's it always so cold around you?" 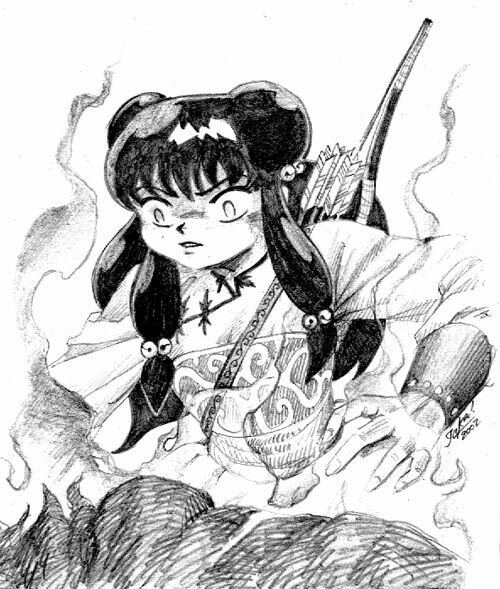 Ranma raised one arm, a small hand emerging from beneath the folds of her cloak. Raising her index finger, she waggled it back and forth slightly. "I had a feeling you'd say that," Akane sighed. "Everything's a secret with you." "All in good time, Akane," Ranma replied, arm vanishing beneath the pitch black fabric of the cloak. "All in good time." "Speaking of time," Akane said, wary of the fading light around them, "how much longer will this trip take?" "We're nearly there," Ranma replied, nodding her head slightly in a gesture toward the forest before them. "Just a little further, at the base of that mountain." "Really?" Akane asked, a sudden excitement in her voice. To have an actual, tangible destination to strive for was infinitely more comforting than simply wandering for the sake of wandering, no matter how vague the description. Akane smiled, happy for the first time in a few hours, and strode forward with a newfound energy. The mossy ground, dank air, and abundant insects seemed like minor problems to her now that she had a goal to shoot for, even if it were only arriving at their destination. She was brought to a halt suddenly as Ranma extended an arm outwards, across Akane's chest, holding her back. "Shh!" Ranma hissed, before silently moving closer to Akane. "I can hear something." Akane blinked, looking around at the trees encircling them. She could hear nothing other than the buzzing of insects that had filled her ears for far too long, and the trickle of water from the many small streams that ran down from the mountains. Looking over at Ranma, Akane saw a tense expression on the redheaded girl's face, head slowly turning as Ranma scanned the surrounding forest for the source of the noise. A silence descended upon them for just a moment, Akane becoming strongly aware of the sound of her own heartbeat. Suddenly, she was surrounded by impenetrable blackness, her screams silenced by the paralysing cold that gripped her whole body. Ranma pulled her cloak tightly around Akane and yanked her aside moments before the source of her suspicion landed where the Tendo girl had been standing. Backing off, Ranma snarled, releasing a shivering Akane from the protection of her cloak. Akane, gasping for air, slumped to the ground near Ranma's feet. Ranma stepped away from Akane slightly, giving her companion a chance to recover. Narrowing her eyes, she glared intently at the girl standing before her with a sword already drawn. The girl was clad in black, with several small daggers strapped across her chest in a bandolier. A scabbard hung loosely from her belt, swaying back and forth slightly. On the opposite side of the scabbard hung several small pouches, each tied closed with a small, frayed piece of string. Ranma snarled, having long ago recognised her assailant. Her suspicions were only confirmed as the girl stepped out from the shadows, into a small shaft of light cast down by the fading sun. Hard eyes burned into Ranma from beneath dark brown hair, eyes that spared only a momentary glance for Akane. "I see you've found another apprentice," spoke the girl in an even tone. "Touch her," Ranma warned, her voice dropping to a dangerous growl, "and I'll tear out your heart, Ukyo." I can feel you inside me ... what are you? I am you, and you are me. We are one and the same. That doesn't make any sense! Just because you don't understand doesn't make it untrue. Who ARE you? What's your name? Do you even have a name? My name is Ranma Saotome. It is not! Don't lie to me! I'm not lying. That's the point, boy. You will. Now wake up; you're making her worry about you. The faint crackling of kindling burning on an open fire tugged at Ranma's mind, lending her support to cling onto as she climbed desperately from the bottomless pit of unconsciousness. She could feel the darkness reaching up to take her again; panic drove her upwards ever faster. The tighter she clung to the faint sound, the louder it got, and soon other sounds joined it -- the distant howling of wind, the chirping of insects. Gradually the darkness fell back, leaving Ranma on the threshold of the light above. Reaching high, she brushed her fingers against it for a moment; straining higher, she took hold of it with her hand. As she tightened her grasp upon it, the darkness fell away behind her, leaving her surrounded in light. Her eyes opened slowly, a dull pounding in her head keeping her from opening them fully. The view was familiar; the same roof, the same faint orange light flickering against it. Blinking a few times to try and clear her eyes, Ranma tried to sit up, wondering how long she had been asleep for. It felt like she had slept only a couple of hours; she was still exhausted. A sharp pain in her stomach halted her rise and sent her plunging straight back down to the bed. Groaning, she lifted one hand and brought it gingerly to the source of the pain. Her hand glided over her smooth stomach, her fingertips bumping up against what felt like a scar; tilting her head, she tried to look down at herself. It was at that moment that a realisation dawned upon her. She screamed, a piercing scream that sent agonising spikes of pain lancing through her skull; the scream was cut short as she grabbed at her head, gritting her teeth through the resonating pain that bounced back and forth within her mind. "Owwww ..." she croaked faintly, her throat hoarse. Someone stirred alongside her; waiting for the pain to fade, Ranma eventually tried turning her head to catch a glimpse of the person who was with her. All she managed to make out was a fuzzy purple outline. "You ..." she breathed, a powerful feeling of anger seeping into her heart, washing away all other thoughts. "You're awake," Shampoo observed, rubbing sleep from her eyes as she stood. "Thank the gods; I thought you were going to die." "You ..." Ranma repeated, staring hotly at the girl as she moved into view. "I've been sitting here for a week," Shampoo explained, stepping closer, "waiting for you to wake up. I've been ... worried about you." "You ..." Ranma chanted, disbelieving her eyes as her father's killer stepped up beside the bed. "I--" Shampoo began, but was cut off as Ranma's hand, of its own accord, flung itself at her throat, choking her into silence as it gripped her neck with all Ranma's strength. "You killed my father!" Ranma gasped through her singed throat, spittle flying from her mouth as she shook with unbridled rage. "You killed my father!" "It was ... self defence!" Shampoo choked, her hands desperately gripping Ranma's, trying to loose the vice-like grip that held her. "You murdered him! He was my father!" "I'm ... sorry!" Shampoo sobbed between heaving gasps for air, hot tears of pain and regret streaming down her cheeks and over Ranma's hand. "I ... had no choice ...."
Ranma cried out in fury, squeezing ever tighter around Shampoo's fragile neck. She could feel Shampoo's pounding pulse beneath her sweat-soaked skin, the desperate attempts to breathe through a windpipe that was rapidly being crushed. "Kill me now," Shampoo choked, letting her eyes close, "if that ... is what you wish. My life is ... in your hands; take it ... if you will." Shampoo lowered her hands from her neck, letting her body go limp as she slowed her breathing. Ranma felt the weight of the Amazon pressing down on her arms and stared at the pale, tear-streaked face of her victim. The anger screamed from within her, burning through her whole body; but within that unbearable din she made out two voices. I understand perfectly. This blade will destroy you and your entire village. I don't want to kill you. I'm here for the sword. Eyes widening, Ranma released her grip upon Shampoo's throat; Shampoo crumpled to the floor, gasping for breath. "I'm not gonna kill you," Ranma said, slowly lowering her arm once more. Closing her eyes, she felt the violent waves of anger subsiding; as calm stillness returned to her mind once more, she opened them again. Shampoo coughed, holding her throat as she raised herself to her hands and knees. She held herself there, making no attempt to stand. "Why am I here?" Ranma asked, her voice quiet but steady. "I ... found you on the beach," Shampoo answered, still sobbing. "You were ...."
As quickly as they came, the images vanished, leaving Ranma panting on the bed. Shampoo knelt silently beside her now, watching with morbid fascination. "I found you lying there ... alive," Shampoo recalled, doubting her own words. "I brought you here and you've been in bed for a week since." "Why didn't you just take the sword and kill me?" Ranma asked, her gaze fixed firmly on the roof, her tone challenging. "I am not a thief," Shampoo said simply, looking down at the ground. "But you are a murderer," Ranma replied in an even tone. It was not an accusation; it was a statement of fact. "Yes," Shampoo admitted in despair, eyes moist. "I am a murderer. I killed your father. "I'm sorry," Shampoo whispered, "I didn't want to kill anyone ...."
"Shampoo," came another voice, "leave us. I wish to speak with Ranma." Shampoo nodded, fighting back tears, quickly standing and rushing past Cologne. Cologne stepped past her great-granddaughter as she dashed out of the hut. Shaking her head sadly, Cologne hobbled over toward Ranma. "She is not yet a warrior, that one," she commented to herself, leaning on her staff as she neared Ranma's bed. "Because she can't cope with killing innocent people?" Ranma asked bitterly, matching eyes with the old woman. "The decision to deal out death is not one to be taken lightly," Cologne said, eyes not leaving Ranma's. "The ability to make that decision and live with the consequences is the mark of a warrior." "Warriors don't have to kill," Ranma shot back, "only murderers do." Cologne sighed, and rested heavily on her staff. "We didn't want to kill you, or your father. We just wanted to take the sword from you," Cologne explained. "You didn't understand its power, and you still don't. It's dangerous in your hands. If you had only listened to reason and given us the sword--"
"Listened to reason?! You were the ones who murdered my father, don't talk to me about listening to reason!" "It was your father who struck first," Cologne pointed out. "We were acting in self defence." Ranma opened her mouth to yell her reply, but stopped short as she realised she did not have one. What Cologne had said was true; it was her father who attacked first. "Your father killed three of my sisters," Cologne continued, "because he didn't understand the power of that sword. If Shampoo had not stopped you, you would have killed her." "I ..." Ranma tried, but the words died in her throat. It was the truth; she would have killed Shampoo without a second thought. "We have both suffered losses; you have lost your father, I have lost my sisters. There must be no more bloodshed." "What now, then? You keep me prisoner here?" Ranma asked suspiciously. She did not trust the old woman's offer in the slightest. "We will keep you here, yes," Cologne replied, "while we nurse you back to health. After that, you shall be free to go." "We brought you back," Cologne said, "because it was the right thing to do. It was your father who wronged us; he paid the price. You were just a bystander." "Lucky me," Ranma sighed, feeling not at all lucky. She felt entirely lost, utterly alone. For the first time in her life, she did not have her father to guide her. However misdirected her father's guidance was, it was better than ... this. "I grieve for your loss," Cologne said softly, placing a hand on Ranma's shoulder. "I am sorry your father died." "I'm ... sorry, for what he did," Ranma replied quietly. "If I'd known what he was going to do ...."
"Don't regret, Ranma," Cologne advised, squeezing Ranma's shoulder gently. "Our actions define us as individuals. You did what you did because of who you are. That is not something to regret." "Then Pops is dead because of who I am," Ranma muttered. "No; your father is dead because of who he was." "And now he's lying in the forest. He's probably been eaten by an animal, or something ...."
Ranma leaned heavily on Shampoo's shoulders, her limbs numb and lifeless; the Amazon girl supported her as she looked down at the small grave. Tears ran slowly down her cheeks, dripping onto Shampoo's arm. "We buried him here," Cologne explained, gesturing toward the small mound of earth, "beside the three he killed. He defeated Amazons in battle, that is quite an achievement for an outsider." "He bested our fighters in combat; few can say that. He shall be remembered as ... a formidable challenge." "I ..." Ranma tried, but words failed to come to her mouth. She forced herself to turn - Shampoo got the hint, and turned Ranma's limp body slightly to face Cologne. Ranma looked down at the old woman, tears in her eyes, and managed a small smile. Cologne matched Ranma's eyes with her own, and nodded silently. Nothing more needed to be said. She turned from the graves and started back toward the village huts. Shampoo followed, carrying Ranma with her. Ranma slurped at the vegetable stew with concealed enthusiasm; her appetite had returned and she was very happy to have a meal in her belly again, but she did not wish the Amazons to think she was letting down her guard. So it was with a neutral face that she ate the stew, at a slow enough pace to not appear as hungry as she actually was. She had been bedridden for two weeks now, and her Amazon captors had been nothing if not hospitable. Considering her father had felled three of the villagers, she was amazed at their friendliness. They seemed to have accepted her as one of their own in the short time she had been with them. She had seen several villagers bringing in food and wood for the fire, but the one who was always present was Shampoo, the very Amazon who had nearly killed her. She was quiet, saying very little if anything at all; she had the habit of never quite meeting Ranma's eyes with her own during the sparse conversations they had. For the most part, Shampoo asked Ranma if she would like some food, Ranma replied, and that was the end of it. The lack of conversation and physical movement lead Ranma's mind to wander far and wide. The return of her female form was a thought that occupied her mind continually; a strong source of frustration for her. Shampoo had explained that the hot water was in fact only a temporary cure, resulting in an angry outburst from Ranma that left the Amazon in shaky silence for two days. She had tried once to upend a steaming bowl of stew over herself, but the ever present Shampoo thwarted that plan. Without any other source of hot water, Ranma found herself trapped in the female body she was beginning to despise. Repeated requests for hot water were made to both Shampoo and Cologne on the occasions the matriarch visited, but all were denied. No reason was ever given; the request was simply met with a unilateral 'no'. She guessed it was something to do with the seeming absence of men from the village. When she was not quietly stewing over her female form, Ranma found her thoughts returning to her father and the promise she had made to him before he died. Her father had always been something of a coward; all talk and no substance. That was not to say he was unskilled as a martial artist - he was indeed very talented - but the talent was mostly theoretical. Genma did not seem inclined to fight for fighting's sake, and always avoided confrontation where possible. Ranma was mystified by the sudden change in her father. It was as though he suddenly became a different person on that fateful day. As Ranma thought more about it, she came to realise that the change had not been sudden at all. Genma had been far more irritable for the past few months; comments that once bounced off him would irritate him greatly. He became far more dedicated to the art, to the point of dragging Ranma to the cursed springs of Jusenkyo for further training. And then, there was the sword. Genma did not carry much in the way of material possessions. He had a strong thirst for money; but that was motivated more by a desire to put food and wine in his belly than to purchase material possessions. Indeed, other than the clothing on his back, Genma had never carried much. Genma was always strongly protective of the sword, explaining at length to Ranma that it was a family heirloom and as such needed to be taken care of. 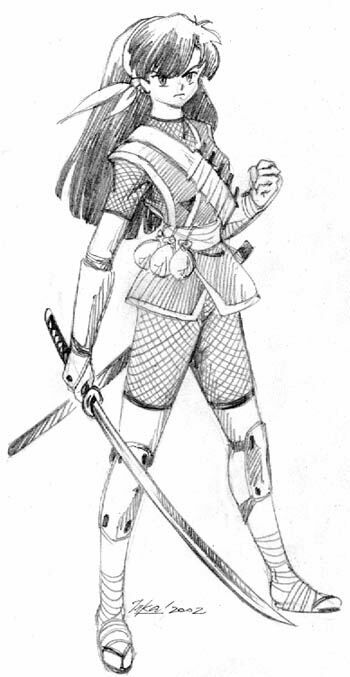 The sword was never used in actual combat; Ranma had assumed that Genma simply did not want to damage the blade. However, Genma began to use the sword during their training sessions, introducing it as 'Garyoutensei', and explaining that Ranma would need to become familiar with it. Ranma had been unsure why it was so important to train with the sword; Genma had until that point been adamant that relying upon a weapon was a weakness that could be exploited. However, grateful for any martial instruction, Ranma listened to Genma's explanations of basic swordplay. He sparred against his father, using a metal blade against Garyoutensei. His skills with the blade were very rudimentary, but he quickly got the hang of the fundamentals. "Fascinating weapon, is it not?" Ranma looked up from the pale depths of her blade and caught sight of Cologne standing near the doorway of the hut. "It does not merely bring death; it brings utter destruction. It is a weapon of immense power." "I know," Ranma replied quietly, returning her gaze to the weapon. "You felt that power, didn't you?" Cologne asked, stepping closer. "When you touched it. Raw power, so deep and profound it almost feels like a living being. "Power that could tear down the heavens," continued Cologne, stepping ever closer. "Power beyond your imagination; power beyond this world." "I felt it," Ranma quietly admitted, eyes lost in the faintly pulsing glow emanating from the sword. "The legend says that where a normal sword cuts only flesh and bone, a dragon's tooth cuts through the very essence of its victims, slicing the spirit form as easily as the physical body. It cuts beyond the world we live in, through the dual worlds of chaos and harmony, through the living and the dead. It's a power you cannot begin to understand, let alone control. "I ..." Ranma murmured, Cologne's voice echoing in her mind. "Give me the sword, Ranma," Cologne said. "I can seal it; keep it out of human hands. It does not belong to this world." The warmth of Cologne's hand on hers snapped Ranma out of her daydream; she glanced up at the old woman, who was gently squeezing her sword hand. "Give me the sword, Ranma Saotome," she intoned, looking intently at Ranma. "Try to control it. Let it go." "What?" Ranma asked, looking up at Cologne. "No, I'm not giving my sword to you." "Because you don't want to, or because you can't?" Ranma tried to loose her grip upon the sword but found herself unable to do so. She became suddenly aware that her hand was straining, knuckles white with the pressure she exerted upon the handle, gripping it as tightly as possible. "I ... can't," she whispered softly, willing her hand to relinquish its grip. Her muscles strained, her arm shook as she tried to let go. A thin sheen of sweat stained her forehead as she pushed herself, fighting to release the weapon. Cologne gently closed her hand around the handle, slowly but surely, taking a firm grip near Ranma's trembling hand. "That's it ..." she encouraged, placing her other hand on Ranma's shoulder, pressing down gently on the small girl's frame. "Now ...."
Cologne gripped the handle and yanked, shoving downwards on Ranma's shoulder at the same moment, tugging the sword with great difficulty from Ranma's determined grasp. She staggered backwards with the blade, which almost immediately lost its radiant white aura. Ranma contorted on the bed, shaking violently as her hand tensed and relaxed uncontrollably, trying to grip a sword that was not there. Cologne, eyes wide, fearfully backed away; with every step she took, the blade grew dimmer. Ranma's shaking increased, small grunts of pain escaping her lips as she struggled to control her body. "The sword," she choked, wrenching her head to face Cologne, "give it back ... please ...."
Cologne looked down at the sword, now a dull grey, and back at the girl who lay choking for breath before her. Ranma shook violently on the bed, her lips beginning to turn blue, her panicked eyes locked on Cologne. Cologne swallowed hard, staring at the obsidian blade; frowning deeply, she looked over at Ranma once more. She had the sword now, but she could not bring herself to take it from Ranma. Shaking slightly, she swallowed and forced herself to step toward Ranma, unable to ignore the helpless, agonised look in Ranma's eyes. "Damn you," she whispered as she slowly lowered the sword into Ranma's clutching hand. "You should have died when you had the chance." Ranma's hand clumsily closed around the sword's handle; immediately the sword flared back to life, the radiant white light erupting from the deep black depths of the blade. Ranma gasped for air, sucking in an enormous breath; the spasms subsided, leaving her dazed, motionless but for the motions of her chest as her breathing gradually returned to normal. "What did you do to me!?" Ranma demanded, her tone dangerous, her face reddening with each breath. "I didn't do anything," Cologne replied, sadness in her eyes. "It was the sword. I had hoped it wouldn't have ...."
"The sword?" Ranma asked, confusion displacing her anger. "Yes," Cologne said with a nod. "This will complicate matters no end." "Huh?" Ranma asked, eyes wide. "What do you mean, complicate? You nearly killed me, again!" Cologne frowned, mulling over her thoughts for a moment. "How best to put it?" she wondered to herself with a sigh. She turned away from Ranma and lowered herself gently to sit at the end of the bed. She leaned forward against her stick, staring intently into the ground. "If you stab someone," she continued at length, "they start to bleed, yes?" "Yeah," Ranma nodded, "of course." "If you pull the blade from their body, the bleeding is much worse than if the blade is left inside the body. The blade itself contains the bleeding, to a degree." "I guess," Ranma agreed, confusion growing by the minute. "I dunno, I've never really stabbed anyone ...."
"I think it is the same sort of situation here, child. The blade must have pierced your very spirit." "Huh?" Ranma asked, bewildered. "My spirit?" "Yes," Cologne nodded. "Everyone has a spirit, it's what binds them to the world. When you die, your spirit leaves your body and you leave this world. Surely you must have some idea of what I'm saying?" "I guess," Ranma tentatively agreed, "I never really learned much except martial arts ...."
"When the sword is pulled away from your spirit, it 'bleeds', and you start to die; to drift away from this world. When I returned the sword, it sealed the hole, so to speak, so you stopped dying. Do you understand?" "How do you know all of this?" Ranma asked, struggling to absorb the information. "When you've been around as long as I have, you learn things about the world," Cologne replied. "I don't know if I believe--"
"The proof is before you; I took the sword away, you began to die. I returned it, you recovered. Believe or don't believe, it won't change what happened, now, will it?" "I suppose," Ranma reluctantly agreed. "What does this all mean?" "For now," Cologne said, standing and stepping away from the bed. She hobbled over toward the door, "You get to keep your sword." Ranma sat quietly on a grassy verge with Cologne nearby. The sun bathed the village in a gentle warmth that was maintained by a warm breeze that gusted every few moments, sending ripples through the blades of grass. It felt good to be in the sun, and Ranma was enjoying her first day out of bed in a long time. She was deathly white, but not as thin as she had been in the beginning; the stew she had been eating in increasing quantities had made sure of that. The warmth was a sharp contrast to the icy cold she had felt for the past week; after her fever had broken, she spent most of her time shivering. Now, with the gentle rays of the sun, she felt a soothing heat inside her body that brought with it a sense of wellbeing. She did not know why, but she did not feel as angry these days. Perhaps it was the care with which the Amazon women looked after her, perhaps it was her simply moving on after the tragedy of her father's death. The more she thought about her father, the more she realised that the Amazons had acted only in self defence. She did not forgive them. No, she could never forgive them; but she could understand what they had done. Shampoo practiced before them, moving through a slow series of motions with her sword. Her sword arced lazily through the air with no real force behind it; the purpose of her exercise seemed to Ranma to be balance and control rather than purely attacking technique. "She's sloppy," Ranma commented, watching Shampoo overbalance slightly on a turn and nearly fall. "Distractions don't matter," Ranma retorted, shaking her head slightly, "not when you're alone with the art." "Mm," Cologne agreed. "You're right. She's young; she hasn't yet reached her potential." "She could do a lot better," Ranma said. "You seem very well versed in the martial arts for someone so young," Cologne commented, looking quizzically over at the redheaded girl. "I had a ... dedicated ... teacher," came the reply with a shrug of her shoulders. "I studied the art all my life." "A commendable pursuit," Cologne noted, "although a little narrow-minded." "Maybe," Ranma conceded with another shrug. Narrowing her eyes a little, she watched Shampoo more closely. "I don't get why she's so distracted." "Me?" Ranma asked, looking across at the old woman. "She's terrified of you. Can't you see it in her eyes?" "I suppose she has reason to be," Ranma sighed. "I did try to kill her." "It's not just that. She ...."
"She is not dealing very well with the consequences of her actions," Cologne explained. "She is letting the guilt destroy her. She was crying for most of the first week you were here; she still cries herself to sleep every night. She doesn't want anyone to know, but ... she's questioning herself as a warrior. I think she wants to leave the tribe." "Can she even do that?" Ranma asked. "If she wants to," Cologne replied. "She would be disgraced and never allowed to return to this place." Ranma looked at the old woman, eyes wide. "She would lose her family, her home, everything. That she is even considering it shows how much this has harmed her. I shouldn't have pushed her so hard ...."
"I ... I'd never thought of that," Ranma said quietly. "I'd been thinking of Pops and me, I ...."
"Of course you were," Cologne said. "You lost your father, your teacher. Shampoo ... Shampoo has lost herself. "She thinks you're a demon," Cologne added, glancing over toward Shampoo. "She thinks you've come from the spirit world to torment her for murdering you. She's waiting for you to kill her." "Maybe she's right," Ranma wondered, squeezing a fist tightly closed, wondering at the clammy feel of her own skin. "I don't seem to be doing anything but making her miserable. I'm still not sure why you're taking care of me." "Perhaps she is right," Cologne admitted. "We're taking care of you because Shampoo wants to prove herself to you. She wants to redeem herself in your eyes and earn your forgiveness. I don't think she really wants to die." "She killed my father. If she expects me to forgive her, she's an idiot." Cologne watched Shampoo for a moment, sighing as the girl made another mistake. Shaking her head slightly, she looked over at Ranma, who was relaxing on the grass, eyes closed. Cologne's eyes fixed upon Ranma's sword, which now lay safe within a scabbard. You really have no idea, Cologne thought. No idea at all. Shampoo swung her sword in a quick overhead slash, bringing the tip of the blade down to touch the dirt near her feet. She was not happy with her performance; she decided to repeat the exercise. Raising her head, she prepared herself for the challenge. Ukyo looked up from the ground, the tip of her sword pressing gently into the grassy earth beneath her. "Don't insult me, monster," Ukyo spat, raising her blade to point at Ranma. "I have no concern for your student. I come for you, and you alone." "Are you all right?" Ranma asked Akane, peering sideways to catch a glimpse of the Tendo girl struggling to breathe. "Yeah," Akane coughed, "but ... don't ever do that again." "I'm sorry, I had no choice," Ranma apologised, staring daggers at Ukyo. "She would have killed you if I hadn't pulled you aside." "I'll cut that lying tongue from your mouth," Ukyo fumed. "Will you ever leave me alone?" Ranma asked, tiredly. "You can't defeat me." "I'll follow you to the ends of the earth!" Ukyo declared, "I'll never rest until I've avenged my mother. I will have my revenge!" "Ranma?" Akane asked, looking at her, then at Ukyo. "Stay back, Akane," Ranma replied, eyes not leaving Ukyo's form. "This is not your fight." "Don't argue!" Lowering herself into a ready stance, Ranma raised her sword across herself in a defensive posture. "Come and get me, Ukyo." Ukyo nodded almost imperceptibly and, as Akane shuffled backwards against the trunk of a tree, charged toward Ranma. Ranma stood motionless as Ukyo hurtled toward her, sword flying through the air; at the last moment, she flicked her wrist, raising Garyoutensei to deflect the blow. Ukyo's metal sword glanced off the hot white blade, sliding along its length, sending Ukyo stumbling off to one side. Ranma twirled silently, following Ukyo's motion with her body, and shoved the other girl with an elbow to her back, sending Ukyo barreling toward a tree. Ukyo raised her arms and slammed into the tree, letting her forearms soften the impact. Growling, she pushed herself off the tree and whirled to face Ranma once again. "Lesson one," Ranma called in Akane's direction. "Don't overextend yourself; you'll lose your balance and end up head butting a tree." "Uh," Akane muttered, taken by surprise, "o-okay ...."
"Don't mock me!" Ukyo raged, leaping toward Ranma. "How dare you!" "Lesson two," Ranma repeated, deflecting Ukyo's wild attack once more, matching a furious flurry of blows with expertly timed parries and blocks. "Don't let your emotions rule your body. "If you do," Ranma continued, ducking below a high swing; she moved forward beneath Ukyo's extended arms and punched her opponent in the stomach, sending the girl staggering backwards. "You'll just make mistakes." "You dare to turn our duel into a lesson?!" Ukyo wheezed, furious beyond all reason. "DIE!" Ranma planted a foot behind herself, bracing against the onslaught of powerful slashes from Ukyo. Blow met counterblow, attack met counterattack; Akane struggled to keep up with the blurred shapes that were the two swords. Clanging sounds filled the forest with each powerful collision of swords, Ranma finding herself being pushed back by the sheer power of her opponent's strikes. Ukyo's anger drove her onwards, her rage giving her a strength and speed that Ranma had not expected. An overhead chop was barely blocked, Garyoutensei holding Ukyo's sword at bay just above Ranma's forehead. Ranma focussed her eyes on the blade, but immediately realised this was a mistake. She felt Ukyo's movement, but by then it was too late; her opponent's free hand sailed through the air and smashed powerfully into Ranma's jaw in a brutal uppercut, sending Ranma's head flying back. "Ranma!" Akane called, jumping to her feet. She was too far away to help; all she could do was watch as Ukyo brought her sword back quickly, swinging it in almost a complete circle. The blade swung over Ukyo's head, behind her back, and was brought up with intense force into Ranma's stomach. Akane's eyes widened in silent horror as the tip of Ukyo's sword pierced Ranma's cloak, silky ripples running through the material as the metal drove deep into it. Ranma cried out in surprise, Garyoutensei flying from her grip and embedding itself halfway into the ground. Her head drooped forward, surprise in her eyes as she looked at Ukyo's face, a face bearing the ultimate satisfaction; the satisfaction of a lifetime dream being realised. "Lesson three," Ukyo growled, eyes intently locked upon Ranma's. "Don't piss Ukyo Kuonji off." Ranma choked, blood spurting from her mouth as she slumped to her knees. Ukyo watched her fall, taking a step back to watch the collapse. Ranma toppled backwards, landing limply on the ground with a dull thud; vacant eyes stared at the sky as a pool of blood began to form around her, Ukyo's sword still protruding from her stomach. "I've done it, Mother!" she cried, throwing her head back and calling to the heavens above. "I've finally done it!" Akane's scream brought Ukyo's attention back to Earth but not in time to avoid the fist that slammed into her face. Ukyo stumbled back, grabbing her nose as blood started to stream over her mouth. Crying out in pain, she snarled angrily at Akane. "You killed her!" Akane cried, apocalyptic anger radiating from her body. "I'll make you pay!" "My fight isn't with you," Ukyo replied, taking a step backwards. "I've done what I came to do." "Yeah, well," Akane countered, lowering herself into a fighting stance, "your fight is with me now!" "If you wish to share in your master's fate," Ukyo said, turning away from Akane, "I suggest you start training. I won't kill a defenseless person. Unlike your master, I have principles." "Why, you ..." Akane seethed, and threw a punch at the back of Ukyo's head. Ukyo was long gone by the time Akane's fist was even halfway toward her, leaping gracefully through the air. She landed softly in a tree branch before launching herself over the treetops and out of sight. "Damn you!" Akane cried, and rushed forward to give chase. "Akane ... let her go ...."
Akane whirled around at the sound of Ranma's voice, abandoning the chase to rush to Ranma's side. She threw herself to her knees by Ranma's head; knee deep in Ranma's warm blood, but far too upset to care. "Ranma," she said, taking Ranma's head into her lap, "I can't believe you lost ...."
"Neither can I," Ranma said weakly. "How on Earth did she get so good so fast?" Akane reached over and gingerly touched Ukyo's sword, unsure of what to do. "Why did you stop me? I was going to--"
Akane fell silent, and looked down at the ever-expanding pool of Ranma's blood. "Don't be so eager to deal out death," Ranma said quietly, coughing on her own blood. "Once you kill someone, there's no way to take it back. If you can't deal with that it will destroy you from the inside out." "Besides; I can usually beat Ukyo with my eyes shut," Ranma replied contemplatively, looking up at the sky. "If I lost, you wouldn't have stood a chance against her. I don't understand how she got so fast. "She must have found some new training technique to improve her speed that much, that quickly." Akane tugged gently at the sword, far too concerned with the immense quantities of blood that pooled beneath Ranma to respond to the insult. She blinked in surprise as Ranma didn't react to the tugging, instead continuing her monologue. "I was sloppy, I should have been paying more attention to the fight. I'm just used to Ukyo being pretty easy to beat ...."
"Ranma," Akane interrupted, growing increasingly worried, "you're bleeding." "I know," Ranma replied, glancing down at the blade protruding from her cloak. She sighed. "What a pain." "What a pain?" Akane repeated, taken aback. "That's all you have to say about it?" "Yeah," Ranma replied, coughing up a mouthful of blood. "But on the bright side, at least it got Ukyo off my back. I should have thought of this earlier." Akane said nothing; she was utterly, utterly lost. "Do me a favour," Ranma said, looking up at Akane's face. "Pull this damn sword out of me. It hurts like hell." "Uhh," Akane replied, numbly. "Oh ... kay." Reaching over, Akane gripped the handle of Ukyo's sword with a pale, trembling hand. She felt as if she were about to throw up. Tugging gently, she heard the sickening sound of the metal sliding out from Ranma's flesh. "Lesson four," Ranma said quietly, as Akane slowly pulled the blade from her midsection. "Don't be overconfident." Akane pulled the blade upwards, watching the metal slide slowly from the inky blackness of Ranma's cloak. She frowned slightly in surprise as she noticed something odd - no blood on the blade. She kept tugging, and slowly as the tip came into view, she saw that only a small part of the sword had blood stains upon it. Staring at the sword for a moment, she then glanced down at Ranma with a puzzled look on her face. "The sword didn't go in that deeply," Ranma answered her question before it was asked. "It's not as bad as it looks." "It looked pretty bad," Akane commented, looking back to the sword. 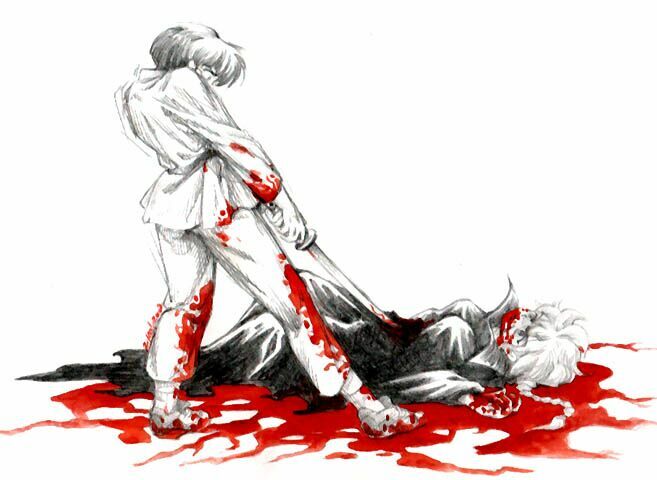 Ukyo had pushed nearly the whole length into Ranma, yet only a few centimetres of its length were stained with blood. "Maybe I should check it out," Akane suggested, eyeing the sword curiously. Surely there should be more blood on the blade? "I've got to find out how Ukyo moved so fast," Ranma noted, deep in thought, ignoring Akane's suggestion. "You're bleeding to death!" Akane exclaimed, her panic finally overwhelming her confusion. Tossing Ukyo's sword aside, she gingerly brought her hands toward Ranma's stomach. "We've got to do something!" "I'll be fine," Ranma said dismissive. "I've taken worse. Don't worry about me. You didn't get hurt, did you?" "Well, not reall-- wait! How the hell can you say you're fine, you're bleeding all over the place!" "Don't exaggerate," Ranma scolded, pulling herself up to a sitting position, and shuffling over a little to lean up against a tree trunk. "Just give me a few minutes." Akane slumped backwards, sitting in the bloodied dirt as she watched Ranma lean back against the tree. Her eyes stared, unblinking, at the bizarre scene unfolding before her. Ranma breathed softly, blood-stained hands emerging from within the flowing fabric of her robe and coming together over her stomach. She pressed them gently down onto herself, closing her eyes and tilting her head back slightly as she applied pressure. Small ripples flowed outwards from her hands, running through the material of her cloak as a quiet humming sound filled Akane's ears. Ranma's mouth opened slightly, her breath coming more slowly through her reddened lips as her body relaxed totally against the tree. She held that position for several moments. "What are you ... doing?" Akane asked quietly, but no answer came. Ranma's head slumped, chin falling to her chest as her hands dropped away from her stomach and fell into her lap. She started to tilt slightly; Akane, noticing Ranma was about to fall, hastily scrambled over and grabbed Ranma's shoulder. An icy feeling stabbed her hand, driving up her arm to her shoulder; Akane jolted back, reeling. She landed hard on her backside, instinctively cradling her hand to her chest, staring wide-eyed at Ranma. Ranma's eyes slowly began to open; where once there was two irises and pupils, Akane saw only pitch black. Gasping, she pushed herself further away. "What ... are you?" she asked, watching as the darkness slowly faded, leaving Ranma's eyes as they once were. "A ... martial artist," Ranma replied with some effort, focussing her eyes on Akane. "Just like you." Ranma stepped gingerly, wincing slightly with each step she took. Akane followed numbly behind her, her mind trying to digest all that had happened. This is far from normal, she thought to herself, looking down at the bloodstains covering her gi. Never in her life had she seen so much blood; and yet Ranma simply shrugged it off as if it were nothing. Akane stared at Ranma, noting the slight wince with each step the redheaded girl took. She does feel pain, then, Akane reasoned. What has she been through that she can just shrug off being stabbed in the stomach? Tossing ideas back and forth in her mind, Akane found herself short of any reasonable answers. She recalled the unnerving sight of Ranma's eyes; the memory threatened to send her train of thought spiraling out of control. The air around Ukyo's sword returned quickly to normal as Ranma and Akane left; without Ranma's chilling presence there was nothing to keep the temperature low. Nobody was around to hear the bubbling sound that filled the air; nor would anyone hear as the bubbling sound became an intense sizzling. Ukyo's sword sank slightly into the muddy ground as Ranma's blood began to steam and bubble around it, a sickly odour of death rising into the air as the crimson liquid began to boil. Within a few moments the blood was gone, evaporated into a thin red mist that was lost on the breeze; leaving Ukyo's sword buried in a steaming patch of dried-out dirt.